Sri Lanka will be in the spotlight as the history-making Jaguar I-Pace eTrophy revs up for a fresh challenge today in the resort city of Sanya in China ahead of the ABB FIA Formula E Championship. It is the world’s first all-electric production based international race series pioneered by Jaguar. 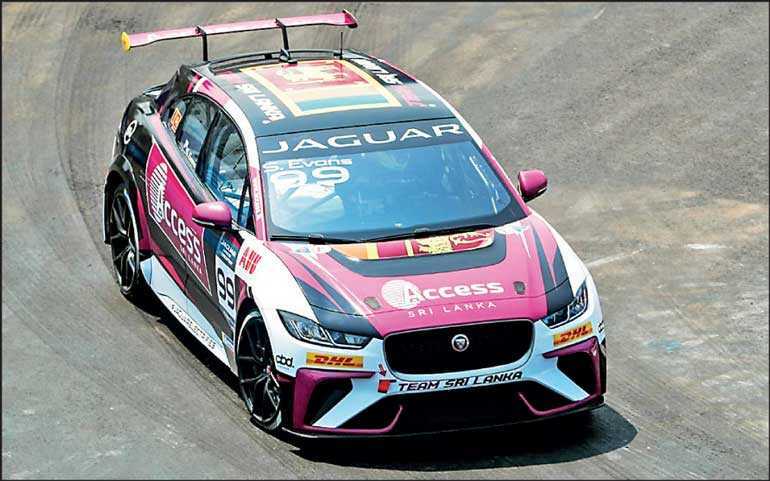 The Jaguar I-PACE eTrophy began in season five of the ABB FIA Formula E Championship and is the first official support race to the street racing series. The championship involves 20 identical I-PACEs, 10 races and one winner. 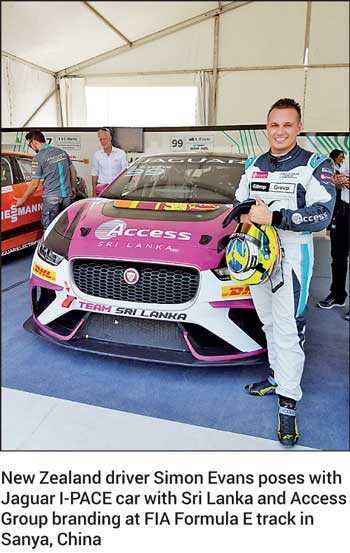 A significant feature of today’s race is one of the competing I-PACEs being branded by Access Group of Sri Lanka, the sole agents for Jaguar. Driven by New Zealander Simon Evans, this I-PACE’s roof is adorned with the Sri Lanka Flag with visible Access Group branding on the rest of the car, along with a few other partner brands. According to Jaguar, the I-PACE eTrophy series will become the next exciting chapter in the global brand’s ‘Race to Innovate’ commitment. Given the fact that 20 production-based Jaguar I-PACE race cars are with identical specifications going head to head, it’s down to driver skill and team tactics to decide who will be crowned champion. Previous Jaguar I-Pace races were held in Saudi Arabia, Mexico and Hong Kong SAR of China. Today’s contest in Sanya is the fourth. Today at 1 p.m. China time, the Jaguar I-PACE eTrophy race will commence, after which the 2019 ABB FIA Forumla E Sanya E-Prix will start. With today’s 2019 FWD Sanya E-Prix, Formula E is returning to mainland China for the first time since the race began in Beijing in 2014. It is a first for the seafront city of Sanya and the final round in Asia for Formula E. There will be 22 next generation cars and drivers in the highly-competitive 2018/19 series. At Sanya there will be five different winners, from five different teams in five rounds of the championship. After Venturi’s Edoardo Mortara inherited a surprise victory in Hong Kong and with two points separating the top four championship contenders, anything can happen in Sanya, say organisers. Sanya’s seafront 2.236km track will see all 22 Gen2 cars and drivers navigate their way through 11 turns in a bid to clinch the win. While the championship might be only five years old, the technology racing around the circuit is ever-changing. Season 5 will see 22 Gen2 cars furiously racing around the track for the very first time. The Batmobile-esque all-electric racer has double the energy storage capacity of the Gen1 car, meaning it can complete a whole race, so wave goodbye to mid-race car swaps. With 250kW of power, the Gen2 will accelerate from 0-100km/h in 2.8-seconds and go on to a top speed of 280km/h. Greater speeds, more action on track and with just one car per driver – there’s everything to lose, say organisers. After joining the ABB FIA Formula E Championship in Season 3, Panasonic Jaguar Racing is into its third season in the series with its new Gen2 Jaguar I-Type III. With one of the richest histories in motorsport of any manufacturer, dating back to 1948, the British manufacturer revived its motorsport program to showcase its range of electric cars with its entry into Formula E in 2016. With over a season’s worth of learnings from Formula E behind it, the British carmaker’s first electric car – the Jaguar I-Pace SUV – made its first production appearance at the 2017 Mexico City E-Prix, driven by Simon Evans. The team’s efforts in the series help it to test, develop and refine the latest technology, which will filter down to the next generation of Jaguar’s all-electric cars. For its inaugural season in the championship, the team signed Adam Caroll and New Zealander Simon Evans to the team. After a difficult season, the team finished at the back of the pack, accruing just 27 points over the 12 races. For its second campaign, the team drafted in inaugural ABB FIA Formula E Champion, Nelson Piquet Jr. to partner Simon Evans, who remained at the team for a second season after his impressive Formula E debut. Finishing the 2017/18 season in sixth place, the team improved its standing in the series but is still yet to win a race. In the current season Panasonic Jaguar Racing team is placed at number seven with 35 points as Envision Virgin Racing at number one with 97 points. The remaining races of ABB FIA Formula E will be held in Rome and Paris in April, Monaco and Berlin in May, Switzerland in June and New York in July including the final. Previous races were held in Saudi Arabia, Morocco, Chile, Mexico and Hong Kong SAR, China.